The French Fintech ecosystem is thriving and boasts today of more than 530 startups. Wow! Even as a sector-specialist VC, we keep discovering new ones every day (see from our 2018 mapping)! 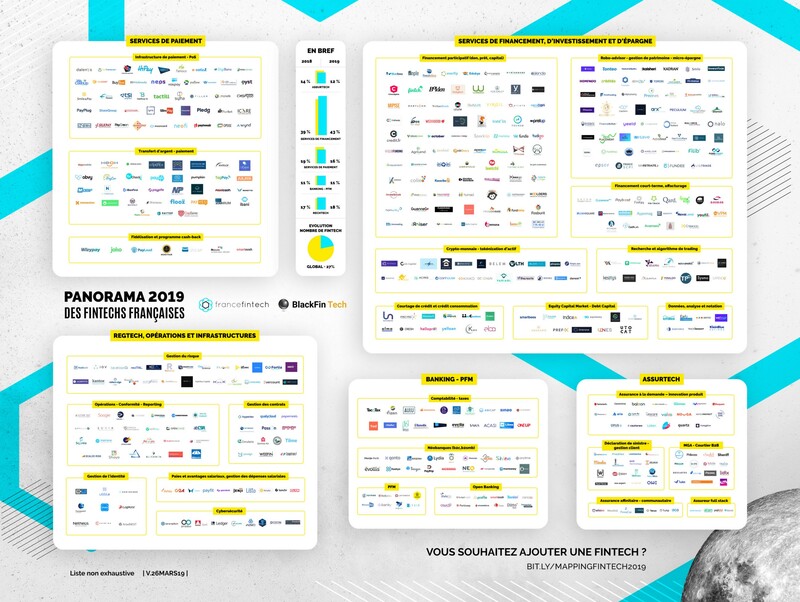 Without further ado, please find below 2019’s version of the French Fintech ecosystem, a joint effort between France Fintech and ourselves! The Insurtech space is booming, and we like it so much! The French ecosystem is getting more and more active, even if we have only one full stack insurer, Alan (See our analysis about full-stack players in Europe) who closed a €40m deal in February. Last year, the accelerator Startup Palace launched its French Assurtech program to support Insurers’ PoCs with selected insurtechs. Besides, we are sponsoring the most active Meetup Group related to insurtech in Paris: last months we enjoyed various meetups about IoT/distribution, Parametrics Insurance and AI applied to claims management. Our next event will be about Cyber insurance with influential entrepreneurs in this sector so stay tuned by subscribing to our newsletter! Payment services are diversifying their activities with PSD2 (finally!) coming into force in 2019, thus enabling businesses like providers of loyalty solutions to leverage current accounts data to offer better services. The Banking/PFM segment is not growing as quickly as others. Probably because strong leaders are already occupying the space in France, think of Qonto (B2B neobank), Lydia (B2C payment app turning into a kind of metabank), Bankin, Linxo & Budget Insight for example. Also, Europeans leaders keep eating market shares, such as N26 achieving the third valuation of the fintech world for instance. In a nutshell, these subsegments are already quite mature and slowly become saturated in France, so that it appears complicated for new players to grow in 2019. Finally, Regtech should be a key topic for 2019. The daunting increase in GDPR/AML/MIFID2/PSD2/you-name-it compliance costs is pushing regulated institutions to implement tools to facilitate compliance checks and reporting. KYC & ID Management remain hot topics (see our analysis about KYC value chain). In this context, 2019 should be the year these cutting edge technologies come off age. Can’t wait for it! May the second part of 2019 be as great for fintech players in France! See our predictions for 2019. If you wish to receive BlackFin Tech’s posts straight into your inbox, click here! The independent European VC for the most promising fintechs, insurtechs & regtechs.